With original photo and text, each gift card is personally designed for the recipient. Use a personal image or select one of ours. Add a message, then place your order.”. 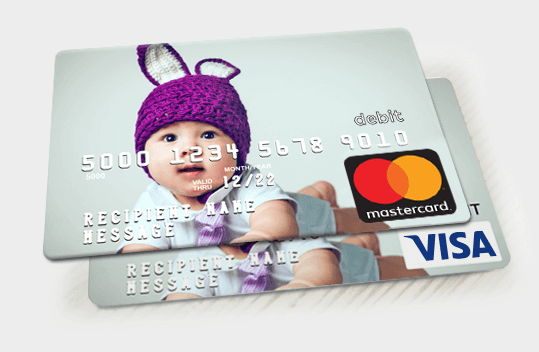 Your personalized gift cards can be used wherever Visa® or Mastercard® are accepted. Anybody can buy a gift card off the rack. 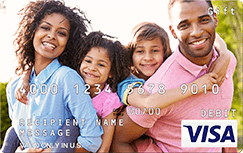 To really show someone you care, take a couple minutes to make a customized Visa gift card or Mastercard gift card. 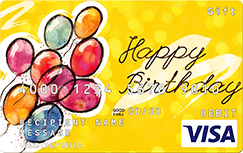 With GiftCards.com, making custom gift cards has never been easier. All you have to do is add a personal photo to the gift card or use one of the images created by our talented pool of gift card artists. To make your custom Visa or Mastercard gift card even more personal, add an embossed message to the front of the card and design a matching greeting card to go with it. Use the same photo for the custom greeting card or pick a different one. Either way, the recipient will think you spent much more time on it than you actually did. See that? Gift cards are convenient for everybody! Find more gift card ideas with GiftCard Girlfriend.